While today’s vast media enterprises have seemed to motivate many writers to fill their endless page spaces with articles on “The Best” and/or “The Worst” album covers of this year/in this category/of all time, there are, in fact, a number of professional/artistic/trade organizations who spend a considerable amount of time reviewing the good and the bad in the category and, with varying degrees of fanfare, each year hand out awards to the producers of these notable works. Below, you will find descriptions of several of these efforts, both here in the U.S. and abroad, with a focus on the awards handed out by music-producing organizations. The Recording Academy has given awards in the “Packaging” category since 1958. Over the years, they’ve changed the name of the category (more formally known as a “genre”) and, on occasion, have divided them into sub-categories and given individual awards to the winners in those sub-categories. For example, for the first three years, awards were given to those who produced the “Best Album Cover”, with the first award being given to Frank Sinatra, who was credited as the art director for his album titled Only The Lonely. From 1961 through 1963, there were awards for “Best Album Cover – Classical” and for “Best Album Cover – Other Than Classical”. In 1964, the musical genres were again combined, but separate awards were given for “Best Album Cover – Graphic Arts” (to both the art director and the graphic artist/illustrator) and for “Best Album Cover – Photography” (art director and photographer). They continued in this fashion through the 1967 awards, switching then in 1968 to a single award for “Best Album Cover” and giving those awards to the individuals or teams who were credited by the record labels submitting their work for consideration. In 1973, the category was retitled “Best Album Package”, and a single award was given to the individual or team credited as art director(s). The category title remained until 1993, when it was re-christened “Best Recording Package”, adding a second award for “Best Recording Package – Boxed” for the years 1994-96, with the award for boxed products being re-titled “Best Boxed Recording Package” beginning in 1997 and continuing that way through the 2001 Awards. In 2002, the second award was expanded to include special or limited-edition offerings and so the award title was changed to “Best Boxed or Special Limited Edition Package” to reflect that fact. The two awards in the category/genre have remained that way ever since. To find out more about the most-recent winners, here’s a link to the organization’s database/search engine – this will display all of the winners in the two main categories we focus on here at the Album Cover Hall of Fame.com – “Best Recording Package” is the award for album cover design, typically given to the project’s art director, and “Best Boxed of Special Limited Edition Package” (again, typically awarded to the art director), which covers box sets and other limited or special-edition packaged music products (all genres). The IMAs were created by Music Resource Group, the past-publisher of a music industry print guide called The Musician’s Atlas and current publisher of the AtlasOnline online contact databases. The IMAs are divided into two parts: 1) The general voting process is determined by a panel industry and artist judges 2) Fans and site visitors can vote to award Vox Populi (“Voice of the People”) Awards. Album Art, Album Packaging, Artist Concert Photo, Artist Publicity Photo, Music Website (Artist, Band, Record Label, etc. ), Poster (Music Venue, Record Release, Festival, etc.) and Swag (Merchandise created exclusively for the musical act or album being promoted). ALEX Awards – The ALEX Awards (“Celebrating the Best Vinyl Record Art” and named after the late album packaging innovator Alex Steinweiss) were initially held in 2003 to honor achievements in music product packaging. Then 86 years old, Mr. Steinweiss accepted a lifetime achievement award at the inaugural gala in Los Angeles. 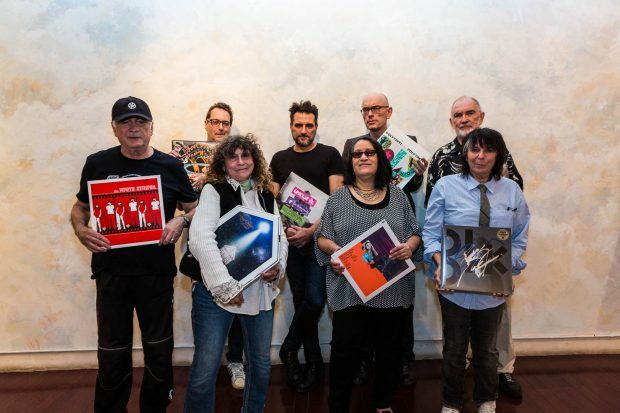 The awards, on hiatus since 2006, were relaunched in 2017 as part of the Making Vinyl industry trade show and included a sterling panel of judges (see photo, below), handing out honors to art directors and album art producers in the categories of “Best Illustrated LP Cover”, “Best Photo LP Cover”, “Best Gatefold” and several others. Front Row – Left to Right: Spencer Drate, Judith Salavetz, Sylvia Reed, Gail Marowitz. Back Row Left to Right: Larry Jaffee, Sean Mosher-Smith, Stefan Bucher, Craig Braun (designer and 2017 show host). Art Vinyl, a UK-based art gallerist and manufacturer of the popular “Play & Display Flip Frames” used by music fans to display their favorite album covers, has produced the Best Art Vinyl awards each January since 2005. The staff at Art Vinyl were responsible for the first-ever UK gallery solely dedicated to record cover design – The Art Vinyl Gallery on East London’s Broadway Market. Art Vinyl is now responsible for organizing the annual “Best Art Vinyl” poll and producing up to 10 record cover exhibitions that simultaneously showcase the best examples of record cover design for the past year. Each November, Art Vinyl initiates their “Best Art Vinyl” search for the most exciting record sleeves of the year. Working alongside a panel of music industry design experts, Art Vinyl selects a shortlist of 50 sleeve designs for the award that will be celebrated in exhibitions around the UK and Europe during November, December and January (and then as part of a touring exhibition throughout the year), with the winners announced that January. The “Best Art Vinyl” exhibition has previously been staged in a number of international venues, including ones in London, Edinburgh, Folkestone, Brussels, Paris, Stuttgart, Berlin Gothenburg and Sydney. This unique award effort sets important dates on the annual media calendar and compiles the global opinion on “the best” in music-related art and design for each year. The JUNO Awards is Canada’s premier music awards show. It is built around a week-long celebration of Canadian music, culminating each March (in various venues/cities throughout Canada) in The JUNO Awards Broadcast, where Canadian artists are recognized for excellence of achievement in recorded music. The JUNO Awards remained exclusively an industry event for the next few years but, in 1975, they assumed a much higher profile when they were telecast for the first time and The Canadian Academy of Recording Arts and Sciences (CARAS) was established to handle the event, working with all segments of the music industry in Canada to promote and celebrate Canadian music and the artists that create it. From 1975 to 2003, there were awards for “Best Album Graphics” and, once in 1977 and then again from 1989 to 2002, also for “Best Album Design”. In 2010, these were combined into the Best Recording Package category, with the first award handed out to the team of Martin Bernard (Art Director), Stéphane Cocke (Photographer) , and Thomas Csano (Designer/Illustrator) for their work on Beats on Canvas – Beats on Canvas . Only CDs, DVDs and Vinyl Records featuring original graphics by Canadian Creative Directors, Graphic Artists, Illustrators and/or Photographers will be considered for this category. American Artists/Groups with Album Graphics designed by Canadians are eligible if the majority of the work or the driving force behind the project is done by Canadian(s). Each year, the Australian Recording Industry Association (ARIA) gives out an award in their Artisan Award category for Best Cover Art. ARIA is a national industry association with more than 100 member organizations, ranging from small “boutique” labels typically run by 1-5 people, to medium size organizations along with very large companies with international affiliates. Proactively representing the interests of its members, the group’s primary objective is “to advance the interests of the Australian record industry by ensuring ARIA is a cohesive, effective and respected organization”. The ARIA Awards have come a long way since its first appearance in front of 500 industry guests at the Sydney Sheraton Wentworth Hotel in 1987 (winners then included Crowded House, John Farnham and INXS, with Big Pig’s self-titled record winning the Best Cover Art award that year). Recognizing the many achievements of Aussie artists across all music genres, the ARIA Awards are the music industry’s annual night of nights and, more than two decades later, the ARIAs are now held in front of 2,500+ guests, 4,000+ members of the general public and broadcast to an audience of close to one million viewers across Australia. The ARIA Awards are open to product released by ARIA members. ARIA members can be artists, record companies, CD distributors, manufacturers, etc. The Artisan Awards Category includes both Producer and Engineer of the Year awards, the Best Video award and the award for Best Cover Art. All entries received by ARIA are first assessed to ensure that the relevant recordings are eligible for the particular Awards for which they have been entered. Once eligibility has been confirmed, all eligible entries received by ARIA are then presented to the Voting Academy and/or Judging Schools for their consideration. Seven (7) categories are judged by the Voting Academy (currently consisting of up to 800 representatives from every area of the music industry); Sixteen (16) categories, plus an award for Outstanding Digital Service (retail) are judged by specialist Judging Schools which consist of representatives experienced with that genre of music /production. There are also four (4) awards – Song of the Year, Best International Artist, Best Australian Live Act and Best Video – which are determined by Popular Vote (online via the ARIA Awards site, with votes limited to “locals only”). The Vodafone New Zealand Music Awards is produced annually (in November) by Recorded Music New Zealand Limited, a non-profit company based in Auckland. Recorded Music NZ is the industry representation, advocacy and licensing organization for recording artists and their labels. Thirteen categories (including Album of the Year, Single of the Year, etc.) are judged by the Voting Academy , which consists of more than 150 representatives from various sectors of the music industry (radio, press, TV, online media, previous winners, retailers, promoters and the like). Categories judged by Voting Schools, comprised of expert representatives (a miniumum of five but, optimally, ten) from the relevant genres or sectors of music and include classifications such as Best Pop Album, Best Alternative Album, Best Urban/Hip Hip Album, Best Music Video, etc, along with the Technical Awards. The Technical Awards – in which the award for Best Album Cover is found – are presented at the Finalists Announcement & Technical Awards a month before the main gala event (i.e., in mid-late October). “Grammy”, “Grammy Awards” and “The Recording Academy” are registered trademarks of The Recording Academy – all rights reserved. “IMA”, “Independent Music Awards”, “AtlasOnline” and “Music Resource Group” are registered trademarks of the Music Resource Group, LLC. – all rights reserved. “Best Art Vinyl”, “Art Vinyl”, “Play and Display” and “Flip Frame” are registered trademarks of Art Vinyl, Ltd. – all rights reserved. “ARIA” is a registered trademark of the Australian Recording Industry Association – all rights reserved. “JUNO” and “JUNO Awards” are trademarks of The Canadian Academy of Recording Arts and Sciences (CARAS) – all rights reserved. “New Zealand Music Awards” is a trademark of Recorded Music New Zealand Limited – all rights reserved.